A few more days and we’re hitting the end of July. Time flies so fast since we are always out of the office, shooting or meeting with clients. And while we love days where we can sit down, share ideas and stories over a bottle of beer or simply bond with our loved ones, we are more than happy to be out and shooting because it is a craft that we all love. Anyway, we can almost smell the BER months and before we get busy with back to back shoots, we are joining the Bridal Caravan Singapore Year 2 this coming August 17, 2014 at the Grand Park Hotel, City Hall, Singapore. We totally had a blast during last year’s caravan that we are excited to be part again of this event. The SG Bridal Caravan aims to bring together the creme dela creme of the wedding industry and their existing / future clients outside the Philippines. This year, a total of 66 wedding suppliers will be participating in this one epic event presented by Christine Ong-Te Events, Wedding Essentials Magazine, and WeddingsAtWork.com. This is an exciting event for all Singapore-based couples! Your wedding preparations is now made easy by this gathering of prime wedding suppliers. And yes of course, we are looking forward to meeting you there! Registration is free so send your RSVP now. 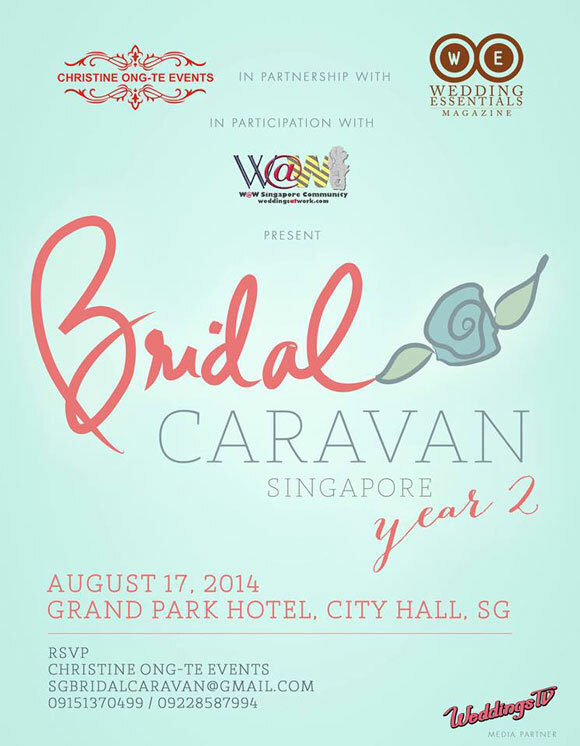 For more details, check out http://sgbridalcaravan2014.splashthat.com.